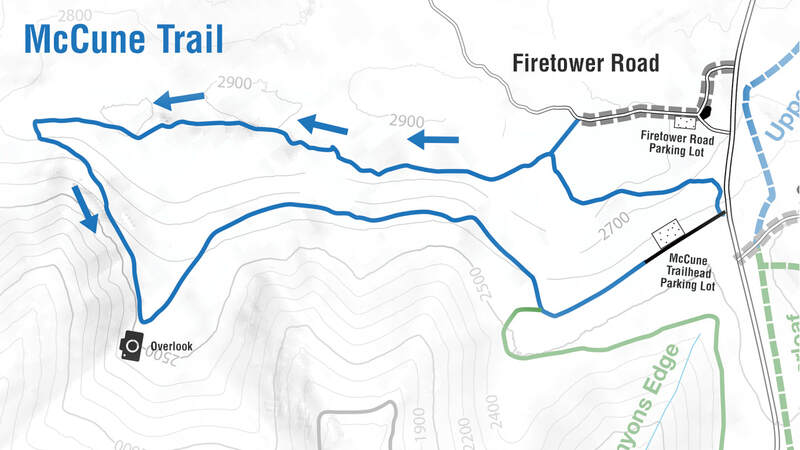 This consists of three connected trails, Canyon's Edge Loop, Upper Canyon's Edge and Lower Canyon's Edge. These are beginner friendly trails that start right from the Sugarloaf Mountain Bike Area trail head. Lower Canyon's Edge is still in development at this time. When approved and completed we will update. 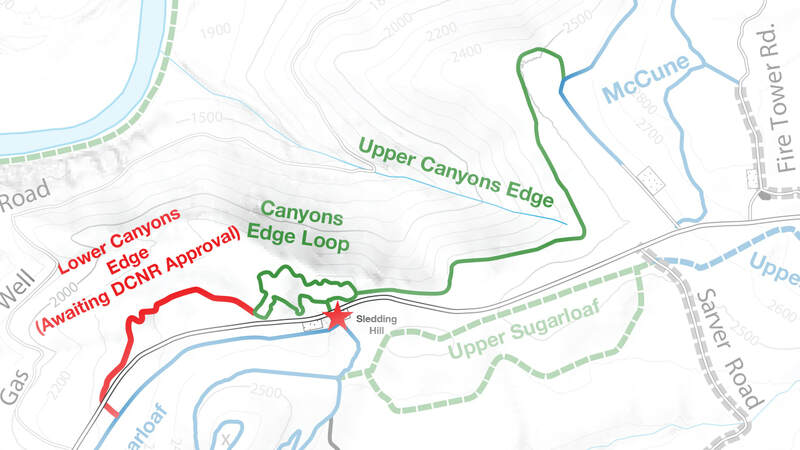 Upper Canyon Edge is a 1.5 mile trail that connects Canyon Edge Loop to McCune Trail. This trail follows the edge of the canyon crosses a small creek and ends where it meets McCune Trail. Upper Canyon Edge is a beginner friendly trail, it does have one fairly easy climb, one creek crossing, and the rest of it is simply a blast to ride. 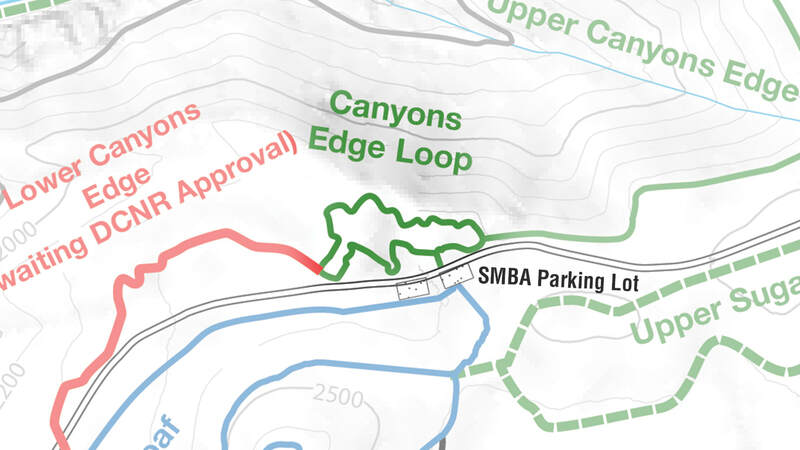 It is not a loop, it’s a fun ride back to the Canyon Edge Loop or you can use it to connect to McCune Trail. This is a more intermediate trail with some great features, big rock outcroppings and some larger climbs and descents. Built as a stand alone trail it is now connected to other trails by the Canyon Edge Trail system. This 4 mile trail has several access points. First is it's own little parking lot off of Sugarloaf Road and second is from a short connector trail behind a gate off of Firetower Road. Most people ride this trail counter clockwise but it can be rode in either direction. This is a more physically challenging trail and it takes some climbing skills and descending skills or you just do a some “ hike-a-biking”. 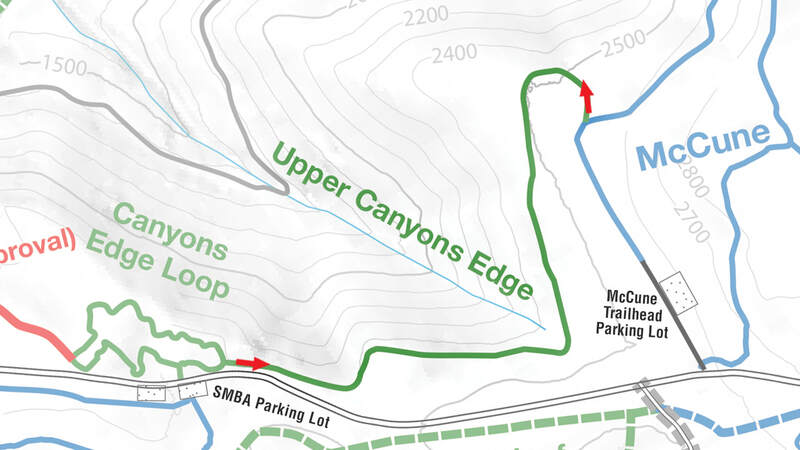 This trail can be ridden either direction but to get started either way you leave the SMBA parking area and cross the grassy field to a short connector trail. The connector trail ends at a 4 way intersection of Sugarloaf Trail. To ride Kim trail counter clockwise make a slight right at the 4 way and ride a grassy trail that parallels Sugarloaf Road for about 1/3 mile, look for the “ Kim Trail “ sign and continue straight and start a long climb on the bench cut. After the first big climb the trail turns left and makes a loop around the top of Sugarloaf Knob, it has some awesome views! 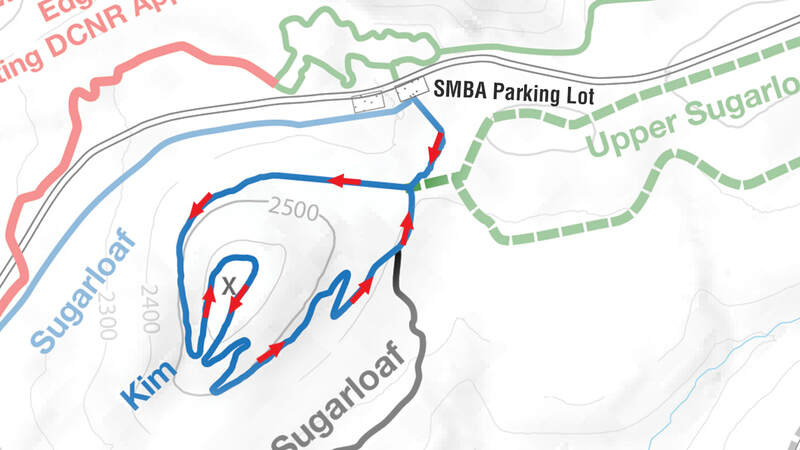 Now it's time for a ripping down hill with switchbacks, berms, and cool features. The trail eventually loops back to the 4 way intersection.